During the four years I have worked in San Rafael I have driven past Muffin Mania many times. It never occurred to me to stop there, I thought it was just a place that sold muffins. But as they point in the colourful and interesting history, printed on the back of the menu because of their name many people don't realise that they also make delicious lunches. 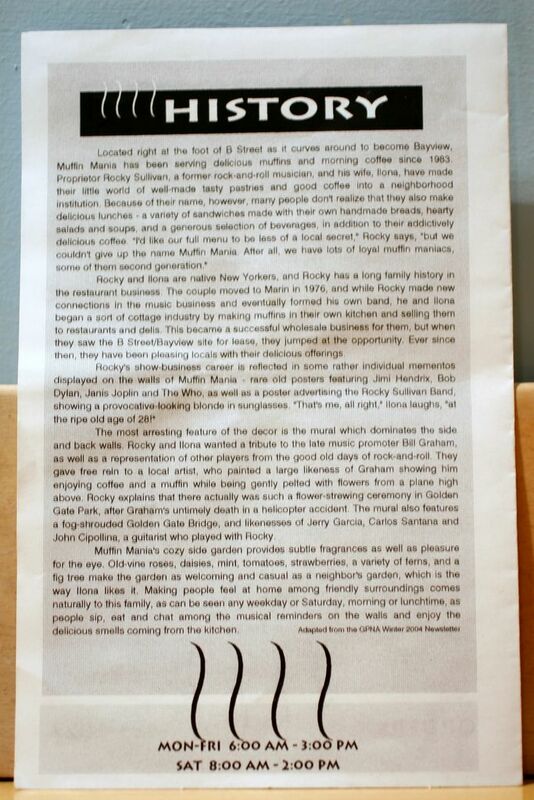 Luckily we have a colleague at work who has been frequenting Muffin Mania for years. His son (now 16) learnt to walk on trips to the little bakery. Knowing about my interest in food, he sent me a menu and on realising it was more than a cake shop, Fred and I decided to try it for lunch. 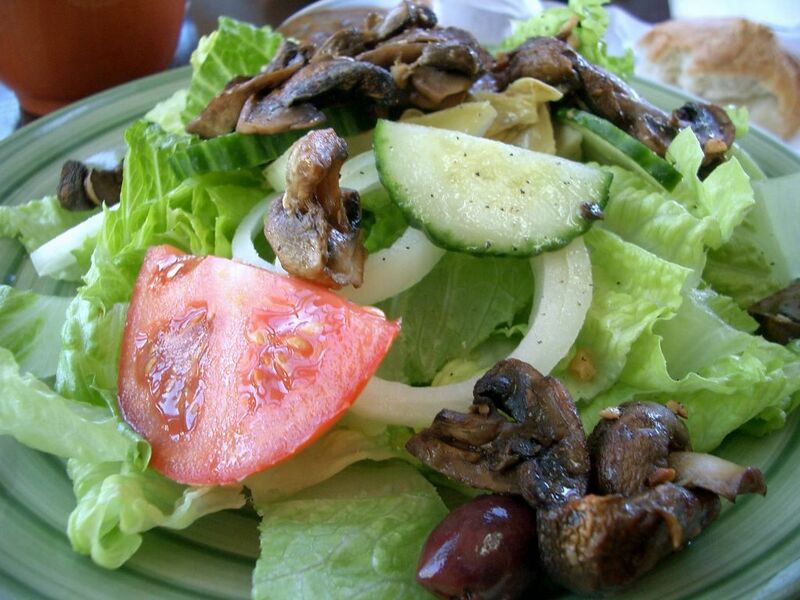 The salads, at $7.25 are large and hearty. I chose a roast mushroom salad. The mushrooms didn't look particularly wonderful but they had a deliciously dense yet refined garlic flavour and a meaty texture. The salads are served with a fresh baked Rocky Roll. I should point out that everything at Muffin Mania is baked on the premises. The bread is heavy, no wonder it's called "Rocky"! 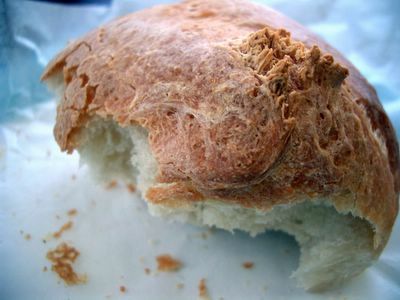 It reminded me of homemade bread and although I think it was a little lacking in salt, I loved the crunchy crust and soft,weighty dough inside. Muffin Mania use homemade bread for their sandwiches too. 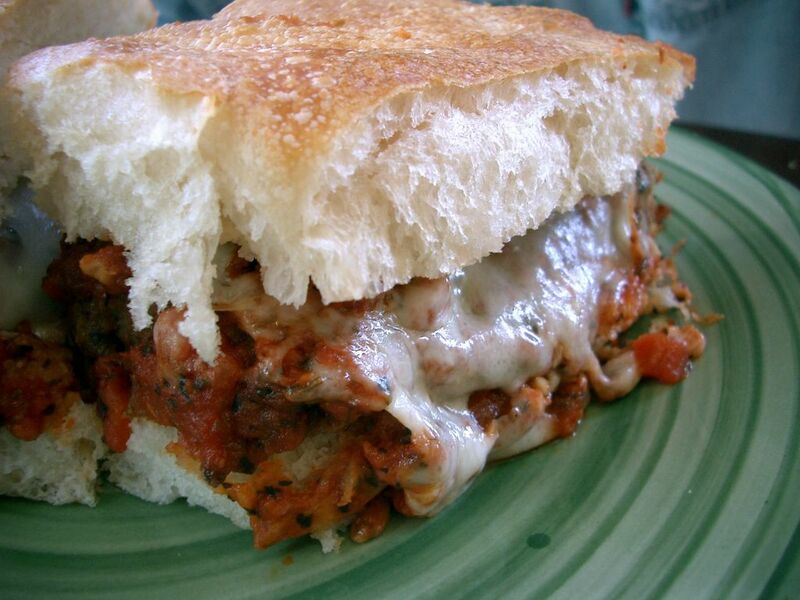 Fred chose a Meatball Parmigiana at $7.95. It was enormous. As large as a brick. Again, the bread was dense and filling. The meatballs were well seasoned and very tasty. Ooh; sounds wonderful! I love places like that. I remember the Rockridge market stores were similar, particularly the bakery...if we didn't get there before eight on Sundays, there wouldn't be any croissants left! And you've never seen two people less likely to crawl out of bed at such an early hour. Fortunately, we lived maybe five minutes from the stores, so we could push it to the last possible minute! 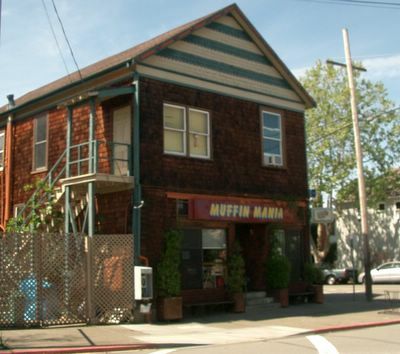 I've been enjoying the muffins at Muffin Mania for 20 years. I can't go everyday, but at least once a week I go for a mouth watering cheddar and jalapeno with cream cheese filling or an apple-cheddar. They also make one of the best house coffees in Marin. Rocky and Ilona have contributed to the culture of "Marvelous Marin" in many ways, but making the best muffins and pasteries is one of the tastiest. I have been a fan of Muffin Mania for over a decade. They have great food and a great atmosphere ----Don't let the name fool you! I would recommend it to anyone looking for a delicious morning pastry (Plus their coffee is great) or a hearty lunch!